I’m Hopeful for Change – Let’s End Homelessness! Canada Without Poverty > News > I’m Hopeful for Change – Let’s End Homelessness! As CWP’s 2016 summer student I have been watching the Super InTent City case unfold very carefully. In the beginning I was hopeful – maybe this would be the stand Canada needs to push for a strong, rights-based, national housing strategy. I was also fearful that this would be just another moment where courts and governments sweep those who are homeless under the rug – where the needs of individuals so deeply marginalized would again be pushed aside. 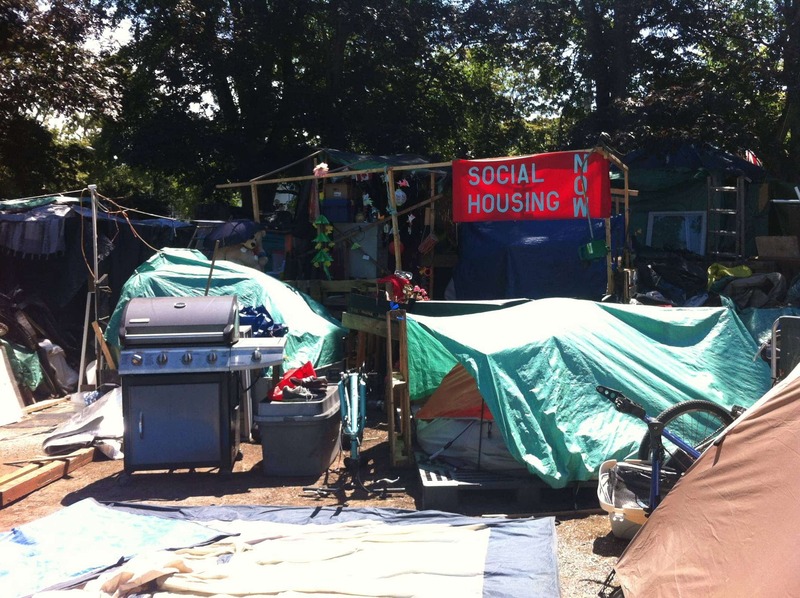 Back in April, Justice Hinkson denied the Government of British Columbia (BC)’s request to remove residents from Super InTent City – a community for persons turned away from shelters and housing support and a safe haven of somewhere to go during the day. The judge weighed the pros and cons of either keeping or removing the tent city erected on the Victoria courthouse lawn. He analyzed the ways in which the neighbouring community labelled InTent City as a nuisance against the increased wellbeing of its residents. To be absolutely clear, concerns about lawn maintenance, impeding public use of the space for aesthetic and recreational purposes, and fear grounded in stigma against those who are homeless were weighed against people’s lives and well-being. In this first decision, Justice Hinkson showed clear support for the life-saving aspects of the community in InTent City and did not let legal nuisance outweigh people’s lives. However, upon a second application by the government, Justice Hinkson decided just two weeks ago to grant the BC government permission to remove residents from Super InTent City. I can’t help but wonder: what happened to change his mind and what does this mean for residents? At first glance, the decision seems like a reasonable one. This summer, the BC government started building 140 housing units for camp residents who want to sign up. BC is also creating more temporary shelter spots and investing money into housing initiatives. The new court order gives the residents of Super InTent City until August 8th to pack up and move into these alternative housing and shelter options. There were also changes within the tent community itself that led to Justice Hinkson ordering it to close. He found the camp had become unsafe. He became concerned about the effectiveness of leadership and relationships with service providers as different people moved through the camp. He also heavily considered the character of the neighbourhood and neighbour testimonies. Overall, I can’t help but think that poverty stereotypes and neighbourhood fear of the homeless were weighed more heavily this time around. So as I read the decision, I felt conflicted. Once again, people experiencing homelessness are being displaced by the justice system, the government and fearful neighbours. Whether Super InTent City has become unsafe or not, there are people in the camp who are entitled to have their human rights respected just like you and me. What’s more, there are over 235,000 people across Canada in similar situations of homelessness, displacement, and socio-economic isolation whose rights are being violated. While a few housing alternatives are being built, there are so many questions left unanswered: When will construction be complete? Will the government respect the community’s rights throughout the transition process? What services are going to be enacted to make sure camp residents can stay housed? Will residents be consulted on what housing and services should look like? Will preventative measures that attack root causes of homelessness be taken? As long as the language in the court room avoids human rights, it’s too easy for concerns rooted in discrimination to be heard over the voices of the people most affected – it’s too easy to dismiss what being displaced means for the health, well-being, and dignity of those in Super InTent City. My hope remains though – maybe people across Canada are paying attention and will demand a rights-based national housing strategy. 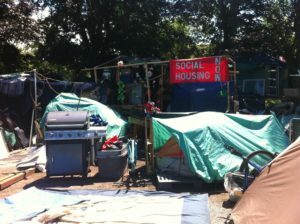 After all, there’s another tent city growing in Vancouver. Maybe this is just the start of a much longer conversation about rights. Jessica Hawkins is Canada Without Poverty’s 2016 summer student and is a law student at the University of Ottawa.